In June of 2010, the company Gerber baby products started their first baby contest ever since 1928. It was an unfinished charcoal drawing of a little baby Ann Tuner Cook that won and became the original Gerber baby. We're not sure if Gerber at the time of starting this new annual baby contest, realized that it was going be that successful and so popular. With over 217,000 baby photos entered in the contest, Gerber was motivated to launch a second "Gerber photo search" contest in 2011. Now, it has become an annual baby photo contest phenomenon. 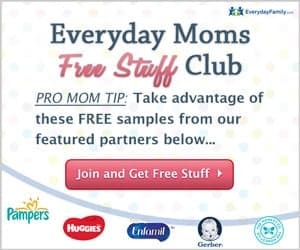 Are you thinking about joining the hundreds of thousands of moms and dads. 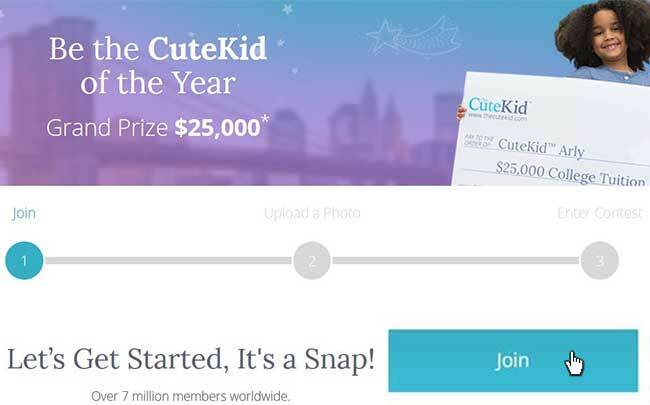 They're trying to take a crack at one of the biggest baby photo contests around today. Are you hoping your baby could become the next Gerber baby? And are you looking for the Gerber baby contest or Gerber baby modeling information? If you are then rest assured that you're at the right place. We have been following this cutest baby contest from the very beginning, since day 1. You will be well informed as to; how to enter, when the contest starts, contest prizes, contest rules, even some advice and tips that could help you win this Gerber's baby photo contest. What are the prizes for winning? Do I have to use the winnings of $50,000 for college? What are the Gerber milestone categories and descriptions? What is the age requirement for the contest? What is the contest photo requirements? How do I enter the Gerber's baby contest? Can anyone enter the contest? Can I vote for my baby to be the next Gerber baby photo contest? How do I vote for the Gerber baby? It's that simple. With only a single baby picture entry, your baby is literally auditioning for Gerber baby model of the year. There's a few things that you need to know about this Gerber's cutest baby contest. It has became an annual Gerber's baby photo contest. But the dates had been inconsistent as to when it launches, the voting periods, the announcements of the Gerber baby contest winners, and even the prizes might changes (although not by much in the last few years). And not to mention, the name of the contest changes as well. Here's what we mean, take a look at the table below. We created this table/chart to give you a quick overview from 2010 to 2015 the changes that have occurred. By looking at the image above, do you notice the Gerber contest's names and contest prize changes? And how about the dates that are fluctuating all the time? It could be some marketing genius's idea to keep everyone in suspense and be on a lookout each year for the big launch announcement. You don't have to be constantly searching for the contest announcements if you're a subscriber to our newsletter. We email our subscribers any contest developments and announcements. Plus, you also get other useful tips and contest information as well. Another thing that might be good for you to know about this free baby contest is a few useful and often confusing terms. Some of these terms confuse us, our readers, subscribers, and we even think it confuses the Gerber people too. The three terms above are simply referring to the same "contest" and the same "grand prize winner" of that contest even though you see the 2015 and 2016. We were for a very long time before finally understanding it as the Gerber Photo Search was beginning to become more of a mature annual baby contest. The term "Gerber baby contest 2015" is actually referring to the actual contest held that year. The Gerber products company announced and crowned the winners in January of the next year, 2016. The new Gerber's contest grand prize winner became the Gerber spokesbaby of that year which in this case is 2016. "Gerber baby" is the term which people are used to calling the grand winner of the Gerber Photo Search contest. So that's how you get "Gerber baby 2016". While there's no such modeling contest to be the Gerber baby, but by submitting a photo entry is competitive enough. The Gerber's baby photo search contest is a serious competition with hundreds of thousands entries each year. Winning it will make a child model out of your baby for Gerber's ads the following year. We hope that cleared things up for you. Before we move on to the Gerber's contests rules and some tips, we'd like to share with you 3 quick tips while you're getting ready/preparing or waiting for when the Gerber's baby contest starts. 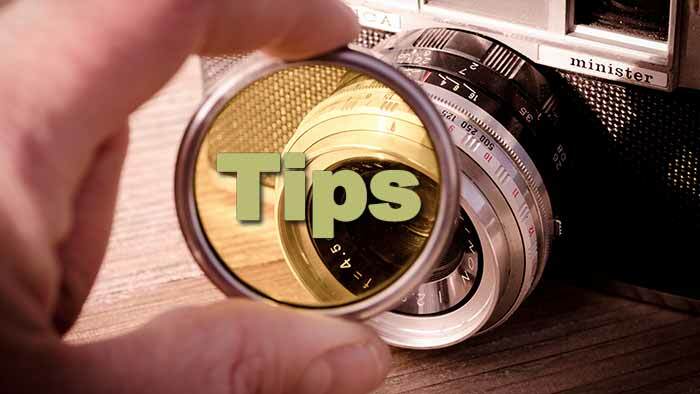 As you're exploring this website, regardless if Gerber Photo Search launched or not yet, these tips for you are applicable to this or all future contests. Getting alerts about the next contest, reminders when the voting period start, or even the announcements of the Gerber contest winners is easy. But if you don't get the alerts you can really miss out. By the way, these contest winners are some of the most beautiful babies your ever see. Again, DON'T MISS the DEADLINE and miss the opportunity to WIN. Here's how you can get alerts right into your email's inbox. As soonest as we get any leaks or new updates, we will email you. That's it! Our readers and subscribers will get all the latest information as it's developing. Subscribe to our NEWSLETTER is simply and easy. Enter your email and click the "Join" button. Getting familiar with any photography contest is always a good idea if you're planning on joining one or even a few of them. It is especially true with this Gerber's baby contest. As with any contest, there are rules and specific do's and don'ts. Always do your best to understand them before submitting a photo. If you get it wrong then the picture you submitted can be disqualified. For example; Gerber doesn't let you submit a photograph that was taken by a paid photographer. Always check with the Gerber official rules and guidelines. You can get familiar with this baby contest thing real quickly just by you spending some time on our website, reading tips about it and even other baby photo contest tips as well. Get alerts from us. We'll be sending you Gerber's baby contest news into your inbox. Get familiar with Gerber's "Photo Search" by exploring our website — ENTRYbaby.com. Finally, it's time for you and your baby to get some experience on your belts. After step 1 and 2, you should be snapping pictures of your baby like there's no tomorrow because you are ready and your child is so cute. All kids are cute but especially yours, at least to you that's what you feel. Taking all these pictures means that you completed step 2, reading on all the photo tips for baby contests. Finally, it's time for you to get your feet wet by having some real practice. If you're reading this and Gerber is running the baby contest then you don't really have the time to practice. But this can also apply to you because there's always next year. Also, you still can implement other tips we provided and go submit your winning photo before the photo submission period ends. Don't rush. You do have until the deadline to submit your baby photo. Once submitted, and you still have some awesome pictures leftover because Gerber only allows one photo. You can then do step 3 too. But submit a photo to Gerber contest first because that's the biggest baby contest and you want to win that. The actual excitement and real deal is not taking picture or photograph of your baby best angle. Not even the cutest baby photo means anything in a photo contest like Gerber if it's not submitted or entered for the opportunity to win. Can you imagine seeing yourself make that first photo submission? Can you can feel your warm blood turned hot? While your heart pumping as hard as it can, you can hear it pounding for excitement of hope. "We are going to win"! You think to yourself while looking at your baby. Yep, entering your baby in an actual real baby photo contest can be like that exciting. It's not just shooting and print or delete. It's competition. It's different. So find or pick a baby photo contest to enter today. There are many baby photo contests available. There's a few contests that we think would be worth your time. This one is our top pick. Contests at the Cute Kid are year round with winners each month. Parents of cute babies and cute kids all over the world are joining everyday and you can be apart of this excitement too. While you're waiting and not knowing when the Gerber will announces the next baby photo contest, why not submit your baby photos to this cute kid contest and get some real practices and a chance to win $25,000. Also keeps in mind, the photos you have right now — may not qualify for the Gerber contest "Photo Search". You have only 30 days from the time you take the picture to the time you submit it. Anything more 30 days, Gerber will not accept and the photo will be disqualified. Here's a quick overview of the Gerber's PHOTO SEARCH rules. As we've mentioned earlier, Gerber changes a few of these contest rules each year. 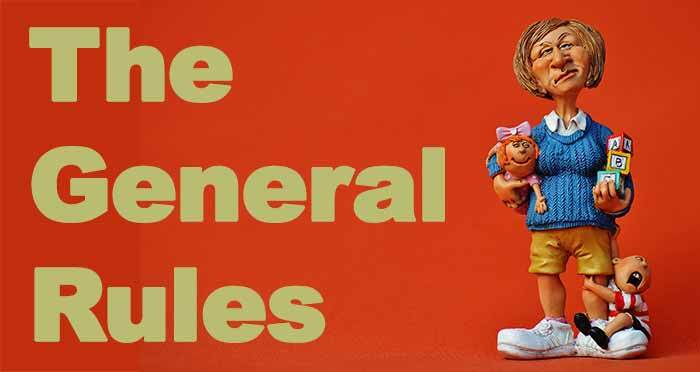 As you're reading this section on the Gerber's baby contest rules overview, keep in mind that these rule are not the Gerber baby contest official rules. You should use this as a guide considering in the past few years contest rules changed non-stop. Especially, the Gerber baby contest 2017-2018 (major changes). This guide is based on what we know of all the previous Gerber baby contests. 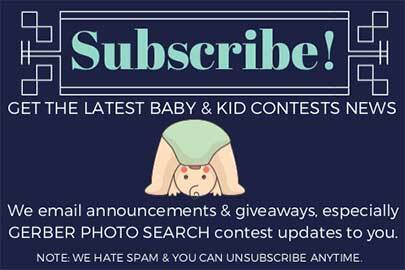 You can come back when we have the new Gerber's baby contest rules or we can notify you if you're a subscriber to our newsletter. You can also click here to visit the latest rules. We do our best to get a copy of it each year and published for you. And we now keep it archived since 2014 for information purposes. Always check the latest official rules. Assuming this year Gerber baby contest will be the same as last year 2016. There one grand prize winner that will be awarded $50,000 cash. To help with taxes, Gerber also added another $15,540 that can be used for tax purposes. There's more. You also get $1,500 for Gerber Childrenswear. That's a total of $67,040. You can view this contest as a Gerber baby casting call because don't forget the opportunity to be featured on Gerber's ads, magazines, TV, and more. Beside the one grand prize winner, there will be 6 milestone winners. Each milestone winner will be awarded $3,500 cash and $750 for Gerber Childrenswear. Total up to $4,250. Do I have to use the winning of $50,000 for college? There are many of you that think the $50,000 is a Gerber baby college fund and you may if you want. The real answer is NO. You may use your winning for any purposes you shall choose. As a matter of fact, with the $15,540 Gerber provides for your taxes you don't even have to use it for tax. You can use it however you want. But we do think it's wise to pay your taxes. Don't spoil the fun by getting in trouble with the IRS. What are the milestone categories and descriptions? There are 6 milestone categories; BIRTH+, SUPPORTED SITTER, SITTER, CRAWLER, TODDLER, and TODDLER 2+. And here are descriptions of each category. BIRTH+ — Your infant may still need head support, gaining some head control, and uses sucking pattern from bottle or breast. SUPPORTED SITTER — Your supported sitter sits but with help or some kind of support. Child can be on tummy and have the strength to push up on her/his arms with straight elbows. He/She is able to move pureed food backward and forward inside their mouth with their tongue to swallow. SITTER — Your sitter is now able to sit without any help or support, and is able to independently pick up and holding small objects with no problem. In hunger, the child reaches for food or a spoon. When feeding with a spoon the child must able to use their upper lip to help get food off the spoon. CRAWLER — Your crawler now crawls clear, without stomach touching the floor; tries to stand by pulling his or her self up; and using fingers to self-feed with jaw mashing foods. TODDLER — Your toddler is standing on their own and has also started to walk by themselves. They begin using their fingers easily to self-feed. They are using spoons, forks, and are trying food with different textures. PRESCHOOLER (TODDLER 2+) — With so much more strength, your toddler/preschooler is now able to run at ease and not fall; is much better at chewing foods and chews efficiently too; using fork and spoon are now mastered. Also at family meals, your toddler is now using a booster or child seat. What is the age requirement to apply for the Gerber baby contest? You can enter as long as your child is anywhere between 1 day old to 48 months old. What's the baby photo requirements? Yes, there a few requirements that you should follow or your baby's photograph will be disqualified. You cannot group your pictures together in a collage, such as taking two pictures and putting them together to make one image. Photo file formats that can be submitted are jpg, png, or bmp, and the file max size is 5MB. Photo cannot be taken more than 30-days at the time of submission. How do I enter Gerber baby contest? The entry date is usually announced by Gerber, there is no set date and it has been changed in the past. Before, you would just upload your photo to Facebook but then a few years ago, that changed. Now you have to register with MyGerber and then visit their website for instructions to upload. Be patients. We'll keep you up-to-date. When does the Gerber baby contest begin? It usually announce some time in the fall and follow by a voting period. Then some time in January of the new year, Gerber announces the contest winners. Can anyone enter the Gerber baby contest? No, only legal residents of the 50 United States, Puerto Rico and District of Columbia can enter. You must be at least 18 years of age (legal age of where you reside) and legal guardians or parents of the child in the photograph. If you're an employee of Gerber then you're not eligible. Also, your family is not eligible. Can I vote for my baby to be the next Gerber baby? No, there's a panel of judges that will pick out a grand prize winner. However, you may vote for the milestone categories and invite people you know to vote for your baby too. How do I vote for the Gerber baby contest? 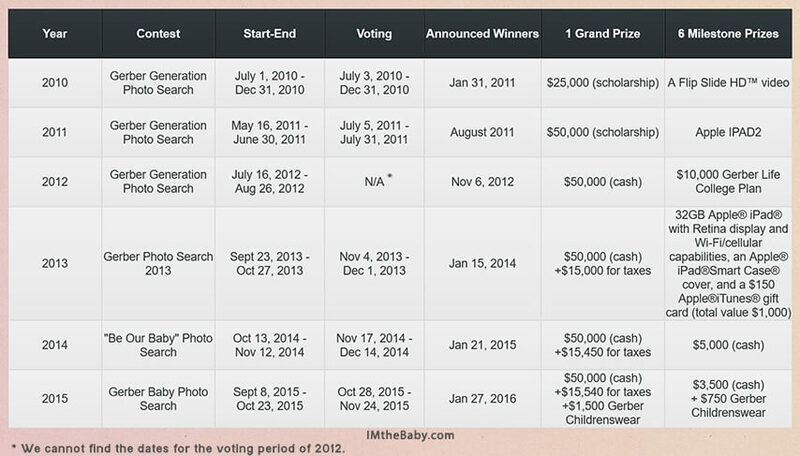 You may vote for the milestone categories however, the voting period and how the voting process could change each year. We can provide that information only when Gerber has announced it. These are general rules that we find helpful but the key is: these rules don't change much they usually remain the same each year. Please check with our most current update at the Gerber baby contest rules pages. We know you want to win the Gerber Photo Search. We have put together the Gerber Baby Contests 101 Guide with 10 useful tips for you because we want you, our readers to win. Be Prepared. It's pretty simple: If you don't have a camera then you're not going to able to take pictures. Having your camera within your reach is important and it is as equally important that your camera is charged, so you're always ready to snap photos when that picture-perfect moment occurs; because it may just happen when you least expect it. Close-ups. Stay focused on your child because that adorable face is the star of the photo. Babies are the cutest and it's a shame if you don't fill that picture up with that cute face. Remember to get close. More Pictures More Opportunities. Magic moments don't just pop-up all the time for the picture-perfect opportunity. Shoot as many photos as you can and you will have several pictures to choose from. From those selected you will have a few that are worthy of enter "Gerber baby contest". You have no reason to not take plenty of pictures, especially with a digital camera or mobile phone camera. Especially since you can shoot pictures and delete at a later time. Natural Is Better. Natural light is always better than your camera's flash. Only use the flash when you have no other option. Find the brightest room in the house or even consider going outside for powerful natural lighting. Make Plans. It doesn't have to spontaneous all the time. There's not wrong with making a plan for a photo shoot of your own. Select a location and make time for you to relax and enjoy taking pictures of your child without hurries or worries. Just have fun. Get Down. Because kids are short, you need to get down to their level, eye-level when possible if you want a great shot focus on a natural look. Baby's Schedule. Only you know your baby's schedule. Pay attention to when your child is the most alert, cheerful and energetic. Example; playtime, nap time, after nap, dinner time, etc. Background Check. If you plan for a photo shoot, then before you start shooting away. Do your best to eliminate clutter, messes, noise and other distracting backgrounds. You want your star to be the focus not the distractions. Get Acquainted. Operating your camera can be easy but it's not always the case. It doesn't matter if you have a DSLR high-end camera or a phone camera. What does matter is that if you want better photos then you should get familiar with how to control and use your camera's features. Keep It Simple. Don't over complicate things. Don't make your child do things that will make him or her uncomfortable. Remember, if that perfect-picture or magic-moment is not happening then don't push it. Keep it fun and natural. Take a break. You can always take another photo or do another photo shoot at a later time. Make the experience enjoyable for you and your child by keeping it simple. The Gerber baby contest is fun for the whole family and exciting to learn about the new winners each year. So take the Gerber challenge and your our Gerber photo shoot today. It's easy to enter baby competitions especial when that baby contest is online. We hope our reader's children are winners. And if you're a winner then please comment below. We love to hear your stories.